In a path-breaking initiative, five of the world’s largest emerging markets — Brazil, Russia, India, China and South Africa forged an alliance to cross-list their respective equity-based products. 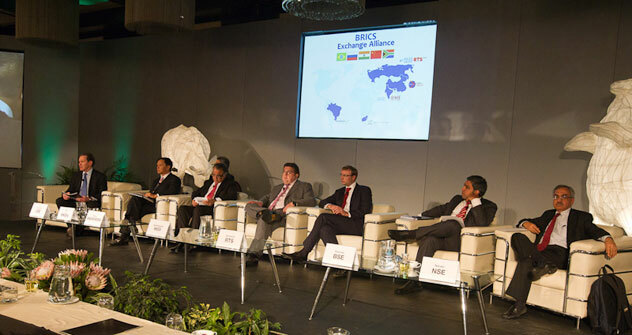 The exchanges of the BRICS emerging markets bloc have announced plans to form an alliance to expose foreign investors to their dynamic economies and to increase the liquidity of their trading venues. This initiative was announced at the 51st AGM of the World Federation of Exchanges (WFE) in Johannesburg, reports RTS. The initiative brings together BM&FBOVESPA from Brazil, MICEX from Russia (currently merging with RTS Stock Exchange), Hong Kong Exchanges and Clearing Limited (HKEx, China) and Johannesburg Stock Exchange (JSE) from South Africa. The National Stock Exchange of India (NSE) and the BSE Ltd (India) have signed letters of support and will join the alliance after finalizing outstanding requirements. At the first stage of this project the exchanges will begin cross-listing of financial derivatives on their benchmark equity indices. It is planned to launch cross-listed products by June 2012. At the second stage of the project members of the alliance plan to jointly develop new products for cross-listing on their exchanges. The third stage may include further cooperation in joint products design and new services development. "Apart from cross-listing products, there are other opportunities for growth and development within this alliance. For example, creation of joint products combining various underliers which will facilitate liquidity growth in the BRICS markets and improve the understanding of other developing markets by local investors," says Ruben Aganbegyan, President of MICEX. According to the WFE these six exchanges represent a combined market capitalization of USD 9.02 trillion, the average monthly trading volume on their securities markets reaches USD 422 billion and the number of their ussuer companies totals 9.5 thousand.